For the entire membership of the Country Club Management Advisory Committee I would like to extend a warm welcome to all PJCC golf and tennis members. This committee is composed of club members, some elected and some appointed, who volunteer their time and efforts to make our club successful. That success is dependent upon your enjoyment of our facilities.. The CCMAC usually meets the third Tuesday of each month in the All-Purpose room in the clubhouse. Membership is invited to attend and speak at these meetings or to express any concerns to a CCMAC member. Port Jefferson Mayor Margot Garant, the Board of Trustees and Trustee Stan Loucks deserve much credit for their continued support of our efforts to make PJCC a premier recreational facility. There are a number of other committees made up of members that contribute to your enjoyment. They include golf and tennis boards and tournament committees which are always in need of volunteers. Although not without some frustration, is usually rewarding. We have a wonderful facility at PJCC and if we all work together, the experience can be outstanding. Have a great 2019 golf and tennis season. 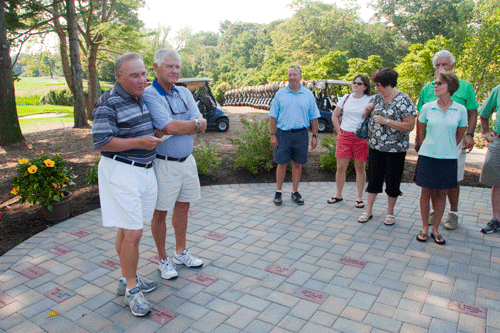 The Country Club Management Advisory Council (CCMAC) works directly with the country club facility, professionals (both golf and tennis) and the Village administration to help manage and oversee the golf and tennis facilities of the Port Jefferson Country Club at Harbor Hills. The CCMAC is instrumental in helping the Board of Trustees in establishing the annual budget, membership drive and other revenue producing initiatives. The Eleven (11) Member CCMAC consists of the President of the Port Jefferson Golf Association, the President of the Port Jefferson Tennis Association, and nine additional members who are to be appointed by the Board of Trustees. Those members appointed by the Board of Trustees serve for a term of three (3) years. All members of the Council serve without compensation. The CCMAC generally meets once a month in The Turn next to the Pro Shop on a Thursday at 7:00PM. Please check the Country Club Calendar for actual meeting dates. A. To supervise and control all facilities comprising the Port Jefferson Country Club. B. To recommend to the Board of Trustees for consideration and enactment local laws for the care, management and protection of said Port Jefferson Country Club facilities and for the conduct of persons therein and for the exclusion of improper persons therefrom. (1) To plan and implement recreational programs and leisure-time and cultural activities. (2) To recommend to the Board of Trustees personnel, equipment and materials for the programs and activities mentioned in Subsection C(1) above. D. To audit the accounts and records of the facilities and to employ qualified parties to assist them where necessary in the audit and control of the financial matters pertaining to the facilities. 1. To unify organized elected groups. Such as tournament groups, and non-affiliated members into one unified whole; thereby providing for representation for all members of the Port Jefferson Golf Club in the oversight and management of policy at the club. 2. To promote good fellowship and foster better relationships among members, residents and the Village. 3. To serve as elected decision makers of the club. 4. To recommend to the Country Club Management Council (CCMAC) and Port Jefferson Village Board of Trustees for their consideration such plans for the care, management, and protection of the Port Jefferson Club facilities and the members therein. The Board of Governors welcomes all members to what we hope will be one of our best golf seasons. The golf course, under the guidance of Superintendent Brian Macmillan, has undergone many changes and improvements. In three short years, Brian and his staff have transformed Port Jefferson Country Club into one of the finest golf courses on Long Island. Your Board of Governors hopes that each and every member enjoys a very special golf experience this season. We encourage you to become involved in the many tournaments and golf outings that are offered throughout the golfing season. We also welcome suggestions that you may have that would improve your golf experience. Your Board of Governors and our Head Pro Bill MacKedon are always available to assist you with any questions and suggestions. Dedicated Paver Project The new patio in front of the scoreboard on the way to the first tee This patio, under the direction Golf Board of Governors and CCMAC, was funded entirely by contributions from members. In recognition of a contribution, an engraved stone paver has been placed in the patio. This is an ongoing program, with monies collected not only funding this patio but also future similar projects and plantings on the golf course. Unengraved pavers will be removed and replaced with engraved ones on a regular basis as additional contributors take advantage of this program. We would like to express special thanks to Ben Kito, a PJCC member, village resident and owner of Kito Landscaping. In addition to a wonderful job, Ben has been extremely generous in constructing this patio at a greatly reduced price to fit our limited budget. If you would like to participate in this project and receive an engraved paver, please fill out a form available in the pro-shop and 19th hole. Contributions are $150 for the first paver and $75. for each additional. For further details speak to Bill Mackedon or any member of the committee.